Once again the weather took its toll on fixtures in the Standard Security Blyth and Wansbeck Sunday League with grounds flooded from Saturday’s heavy rain. Burradon and New Fordley’s All England cup match away at Newton Aycliffe will now take place this coming weekend with a 1pm start. Only one of the NFA Minor Cup games was played. Marden Residents will try again next week when they should have home advantage. Spring Gardens and Ashington Station Lounge must wait until the New Year to play their tie. Meanwhile High Street were at home against Walker Jubilee but went down 3-2. Their task was made harder after they had their keeper sent off after ten minutes for handling out side the penalty area. They soon went behind and weree two down at the interval. In the second half, the Street came storming back and drew level with goals from Anthony Goldie and Chris Arkless. But tiredness set in and they fell behind again to lose 3-2. It was a good effort from the ten men with Reece Dobie the pick of the team. In the premier division, Broomhill North End Trap went down at home against Ashington Town Central. In an exciting game there was plenty of goalmouth action. However, better finishing from Central’s forwards won the day. Goals for Trap came from Kevin Bell, Joe Henderson and Darren Smith. Kevin Chapman led the scoring for Central with a hat-trick and Stephen Frater scored the other two goals. 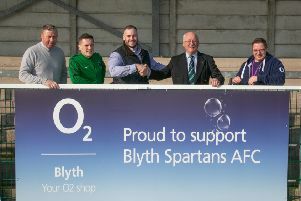 In division one, Blyth United Services’ game against FC Beacon was called off.